Haico grew up in The Netherlands in a very multi-cultural environment. East Indian, Surinam, Indonesian and many others. This helped him to develop a taste for sophisticated spicy food at a young age. 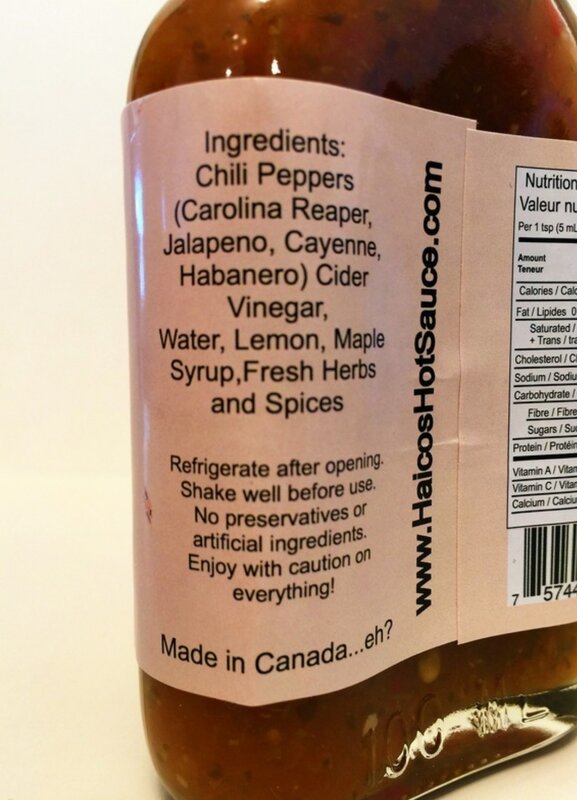 Once Haico moved to Canada he tried to find the same level of flavor and heat in the hot sauces and cooking in Canada, but to no avail. Disappointed Haico decided to take over the world of hot sauce by growing his own peppers and making his own hot sauce. The result of this endeavour is an ever growing number of hot sauces varying in spiciness from mild to wild. 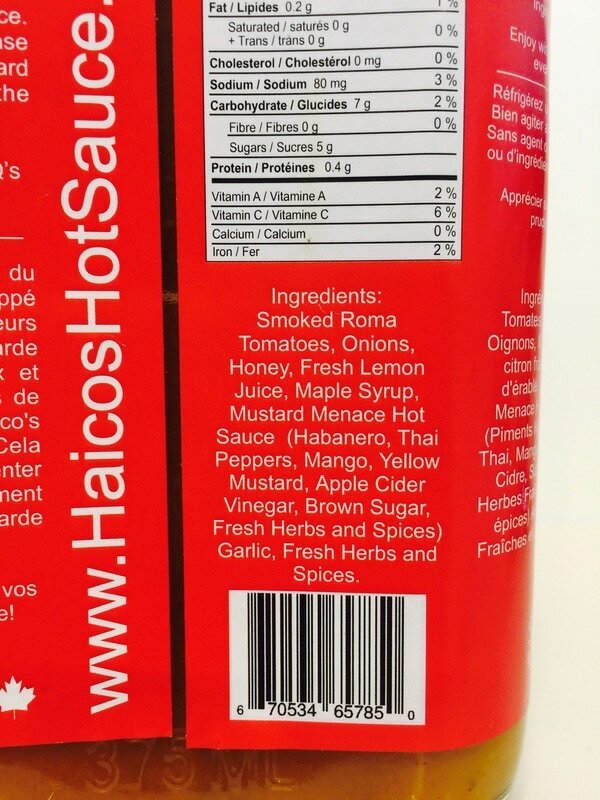 All peppers and most ingredients are home grown in Ottawa by Haico and his wife. Any ingredients that cannot be grown locally, due to the weather (like peaches) are purchased on local farmer’s markets whenever possible. The peppers grown in the Ottawa backyard vary from Hungarian Wax Peppers, Jalapeno’s and Chili’s on one side of the heat spectrum and on the other side there are Ghost Peppers, Scorpion Peppers and even Carolina Reapers, the current Guinness World Record holders for being the hottest pepper on the planet. The result is a wide variety of hot sauces, all with their own distinct flavor palate and heat level. In other words, there is a flavor for every pepperhead or wannabe pepperhead out there! Even people that have never had a liking for hotsauces will be convinced and converted. 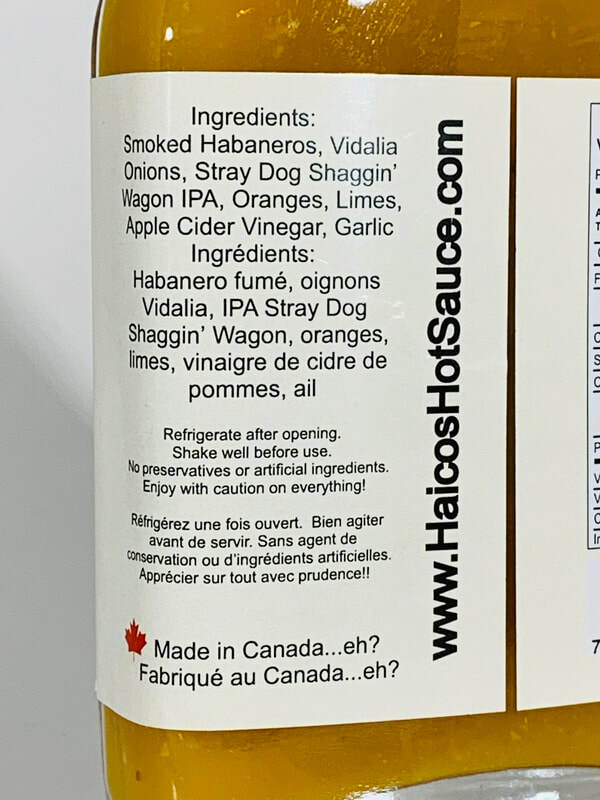 Before embarking on this journey together, Haico’s wife thought that ground black pepper on food was too spicy, but when cooking now, Haico’s Hotsauce is a staple in every recipe! 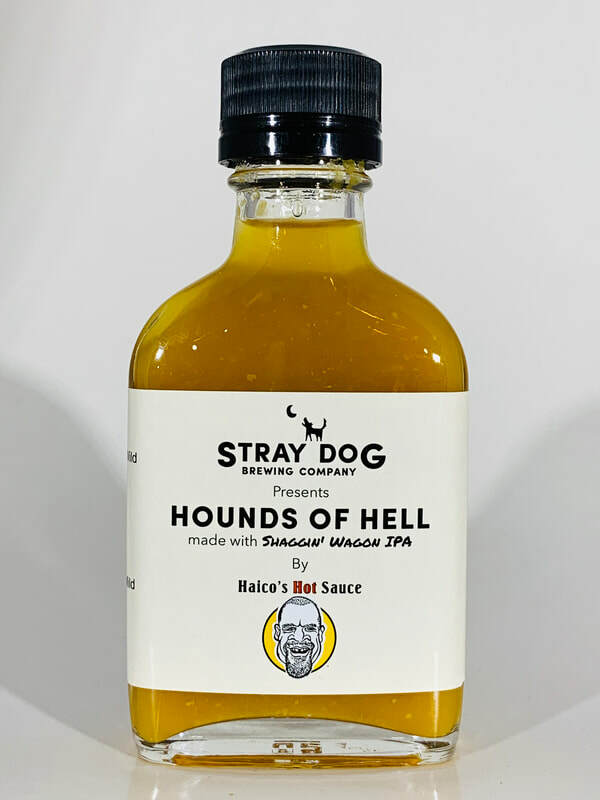 HOUNDS 0F HELL from HAICO'S HOT SAUCE.. Haico used Stray Dog SHAGGIN' WAGON IPA in this great tasting sauce along with smoked habanero, Vidalia onions, oranges, limes, apple cider vinegar and garlic. You can smell the habaneros and citrus as so as you open the bottle. The IPA is very slight but at the end you get the flavor of the beer as you swallow and as the fumes reach your sinuses. Its has a wonderful mix of flavors that will go with just about any food. The flavor of the oranges and limes make this a a wonder fish taco sauce. Its unique flavor would make any pizza, eggs, tacos come to life. The heat has a great match with the flavor and it will stay with you long after each bite. This is an amazing sauce you should definitely try on your next meal. 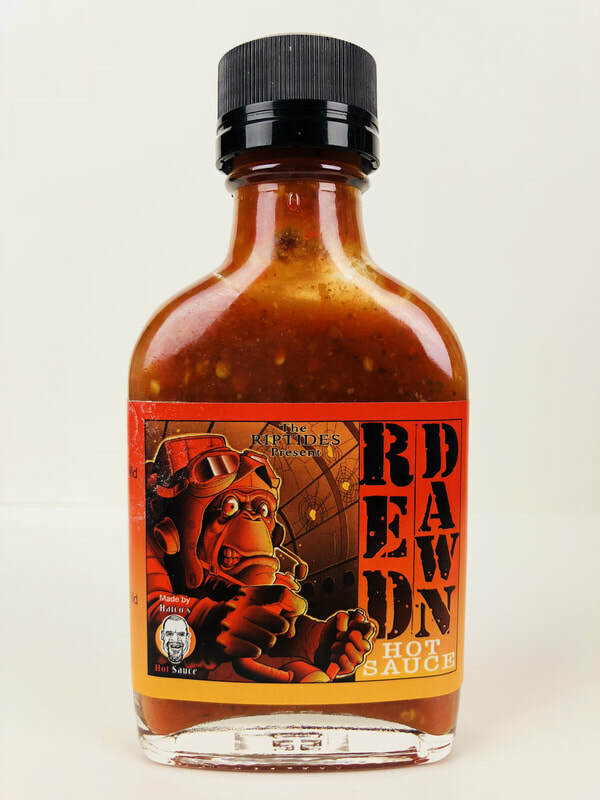 RED DAWN from HAICO'S HOT SAUCE.. This is a celebrity collaboration with the Canadian punk band THE RIPTIDES. 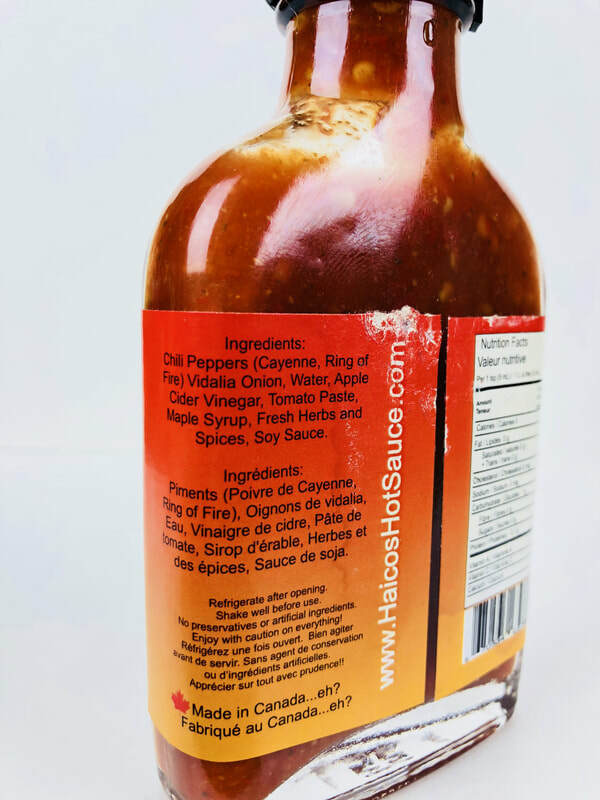 This sauce has its unique flavor coming from the use of the Cayenne and Ring of fire peppers, followed by Vidalia onion, apple cider vinegar, tomato paste, maple syrup, fresh herbs, spices, soy sauce and lots of garlic. 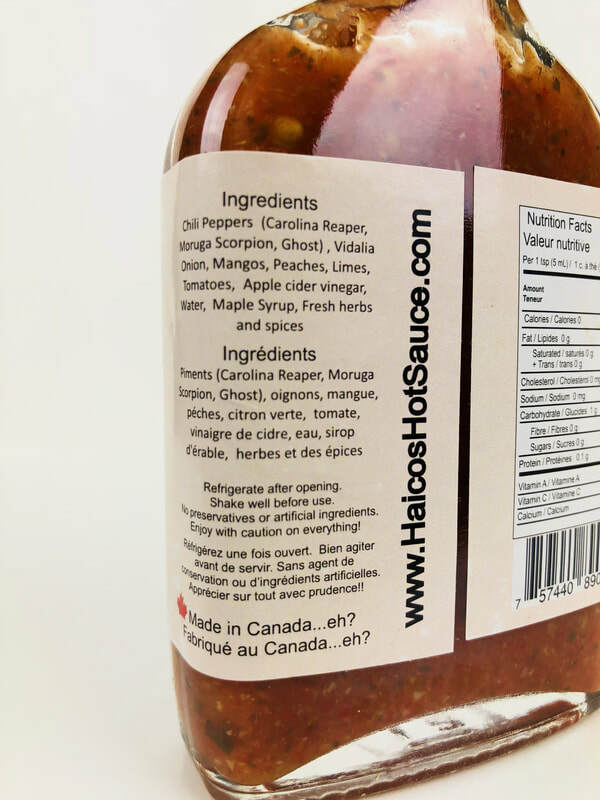 The taste of this sauce comes across like a spicy tomato sauce with a kick and flavor from the hot peppers and a slight sweetness from the maple syrup. But the addition of the herbs and spices takes it over the top in flavor to give it a slight Italian flare like a spicy pizza (tomato) sauce because of the added oregano and garlic. This sauce would be an awesome table sauce to use on just anything. From eggs, pizza. spaghetti, tacos, pulled pork and so much more you need to heat up without burning yourself out. 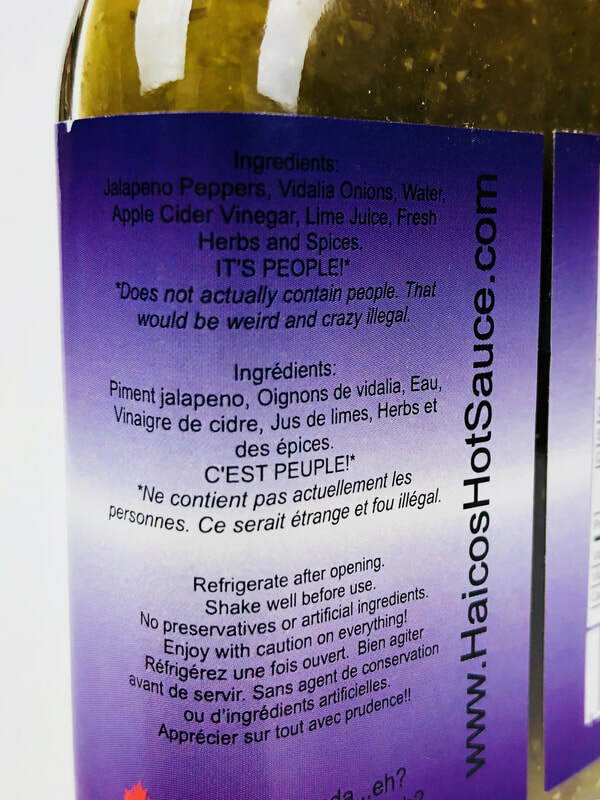 SOYLENT GREEN from HAICO'S HOT SAUCE.. This is another celebrity collaboration with the Canadian punk band THE RIPTIDES. Although this sauce is not made out of people like in the movie of the same name, it will definitely make you wonder whats in it. 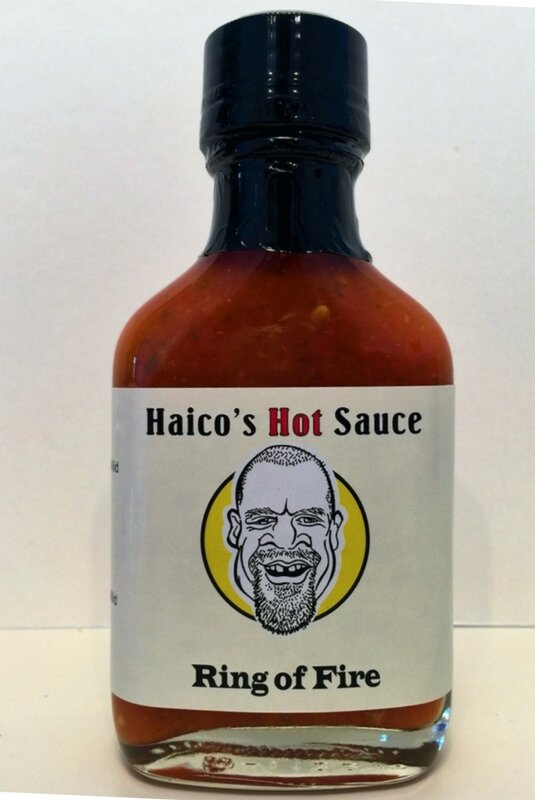 Haico has taken Jalapeño peppers, and combined them with vidalia onions, apple cider vinegar, lime juice and fresh herbs and spices to make another unique hot sauce to match the uniqueness of THE RIPTIDES! The jalapeño pepper flavor is front and center followed by a hint of dill and onion. Its more of a mild sauce in heat and flavor but it works wonderfully to bring a pop of flavor to any dish with out changing the flavor of your meal. Fish, sea food or meat tacos, eggs, add to tar tar sauce, pour it on burgers, hot dogs, chicken or just about any food. 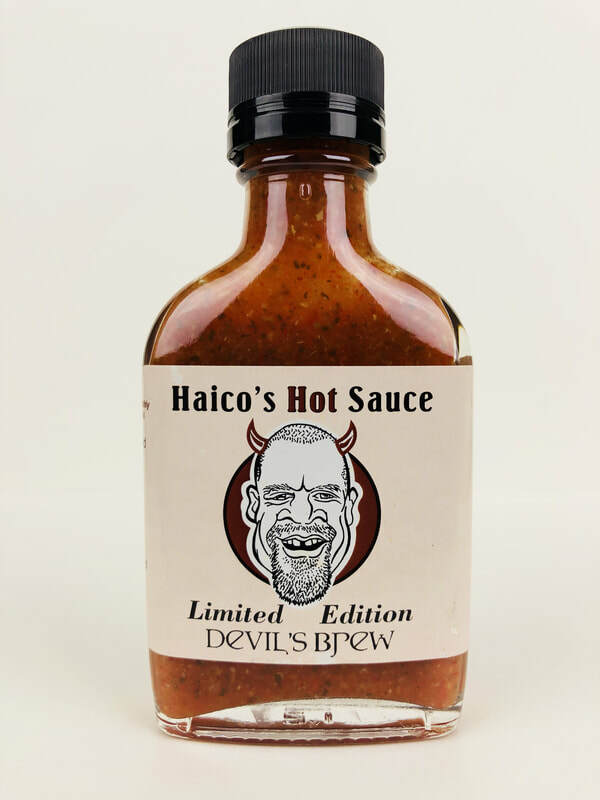 DEVIL'S BREW (LIMITED EDITION) from HAICO'S HOT SAUCE.. Devil's Brew is the perfect name for this sauce. Made from the three hottest peppers in the world. (Carolina Reaper, Moruga Scorpion and Ghost) This one will definitely fire you up! You will find a slight sweetness and fruit flavor from the addition of mango, peaches and maple syrup. Plus the added benefit of flavor coming from the vidalia onions, The lime and apple cider vinegar blends together nicely to bring a tanginess to make this sauce come alive with out being over powering. You will also find the tomatoes, herbs and spices are the bass of this sauce along with the pepper mash to make this a thick and very delicious hot sauce for the extreme chili heads. If you can handle the extreme heat, dig in! But if you can't, Mix this into some cream cheese or ranch dressing to make a wonderful dip for anything you want to fire up with flavor. Wings, eggs, chili, chicken, fish , tacos and more! 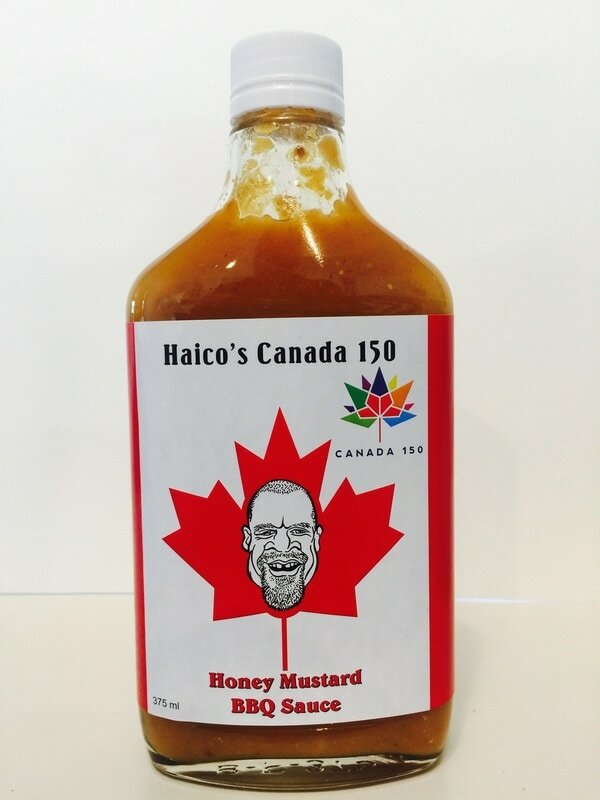 HAICO'S CANADA 150 HONEY MUSTARD BBQ SAUCE from HAICO'S HOT SAUCE.. Haico's knocked it out of the park with the flavor of this BBQ sauce! It has a little sweetness from the maple syrup, honey and brown sugar with a hint of mango that works wonderfully with the smoked roma tomatoes, and adding the mustard and garlic is a fantastic way to bring all these flavors to life. You also get a nice taste of onion that adds to it's uniqueness. Haico added a little of his MUSTARD MENACE hot sauce into this BBQ sauce to bring a little heat and flavor from the Habanero and Thai peppers. If you love it's flavor but want more heat, you can just add some more MUSTARD MENACE hot sauce without changing its great taste. We grilled pork chops with this and they were out of this world, what an amazing combination! This would also be an amazing sauce for ribs, pulled pork or chicken, as a marinade or just pour it on. I'm lovin this BBQ sauce. 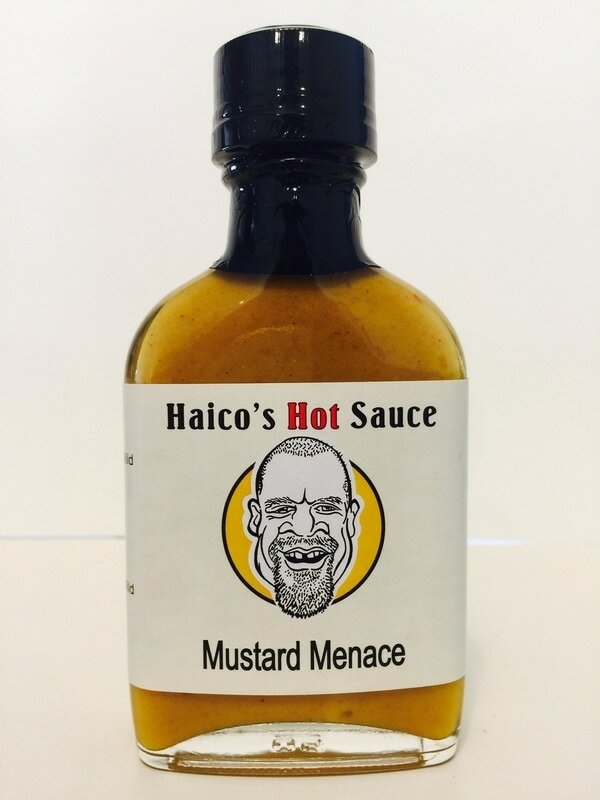 MUSTARD MENACE from HAICO'S HOT SAUCE.. 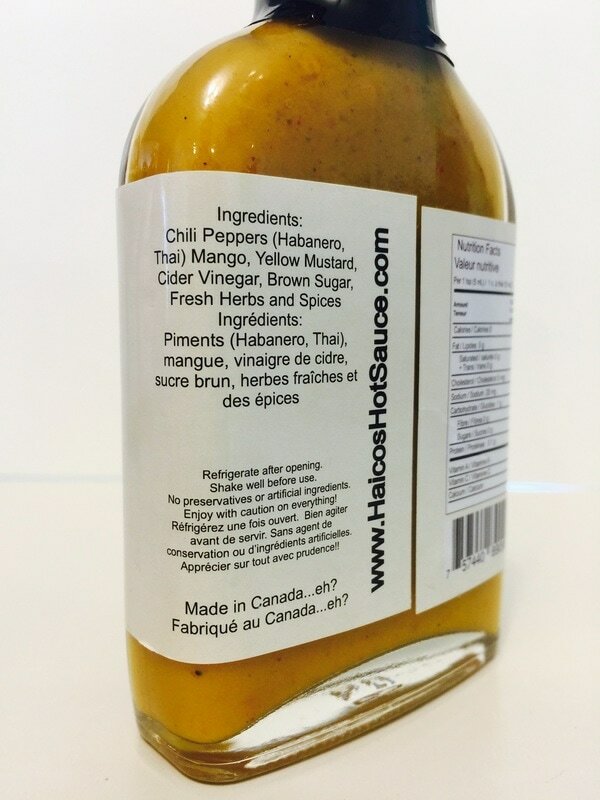 This sauce has an amazing aroma from the mixture of habanero and Thai chilis, mango, yellow mustard, cider vinegar, brown sugar and fresh herbs and spices. 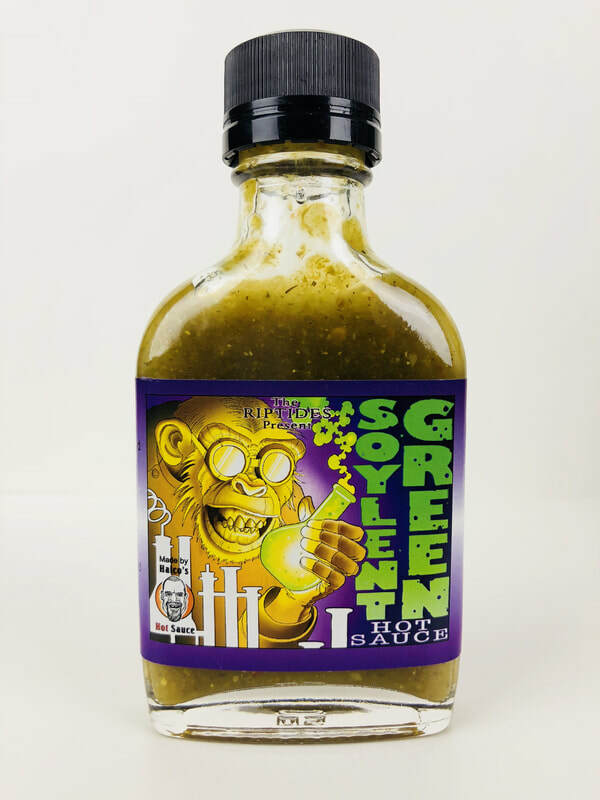 The flavor is just amazing with it's mustard under tones, great pepper flavors and I get a slight nutty flavor that really sets it apart from other mustard style hot sauces. I also get a hint of turmeric that brings out the East Indian influence, with the mango adding just a little sweetness. You can use this on any foods you would use a standard yellow mustard to really bring out the flavor. We made potato salad with this and it was incredible! 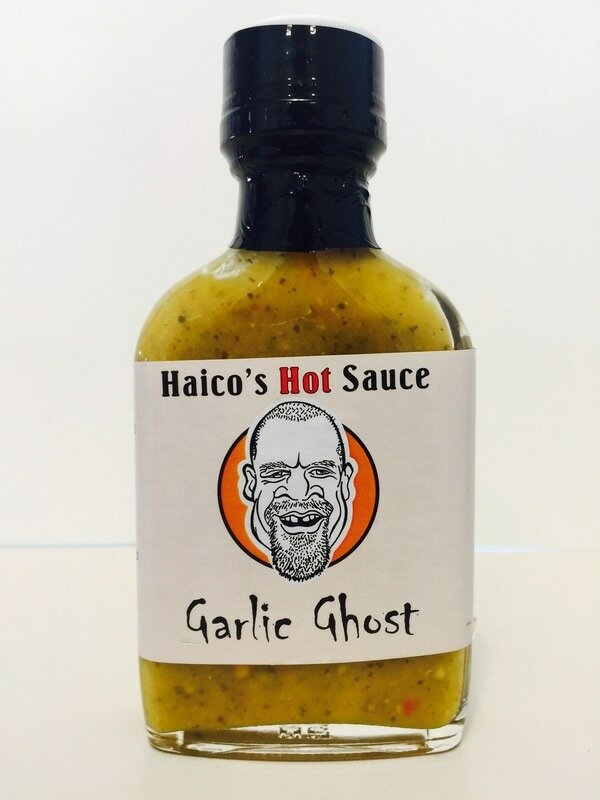 GARLIC GHOST from HAICO'S HOT SAUCE.. Haico takes another twist on a mustard hot sauce, with Garlic Ghost. Some hot sauces with this much garlic added in can give it a bitter taste, NOT in this case! The garlic is strong and flavorful with a slight sweetness from mango, and the great flavor of the Hungarian wax pepper. This is a gourmet, stone ground style mustard. At first taste, you would think it's not that hot, oh but hold on, it will really heat up! The heat lingers from the addition of three of the hottest peppers in the world, Naga Viper, Moruga Scorpion and Yellow Ghost. 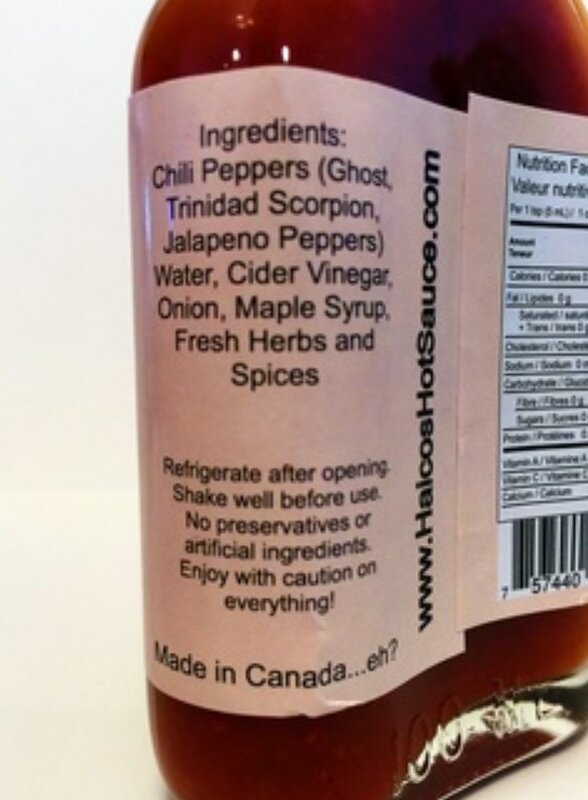 This hot sauce is a sleeper and when it wakes up, it will let you know you've had the Garlic Ghost! I loved this on my roast beef sandwich and luckily the flavor is out front and strong so I only needed a little to enjoy it without burning my face off! So good! 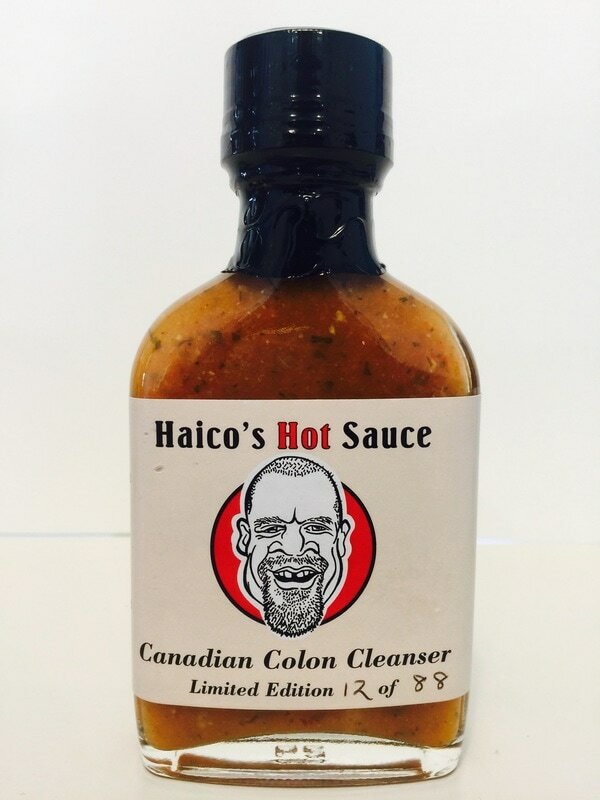 CANADIAN COLON CLEANSER from HAICO'S HOT SAUCE.. 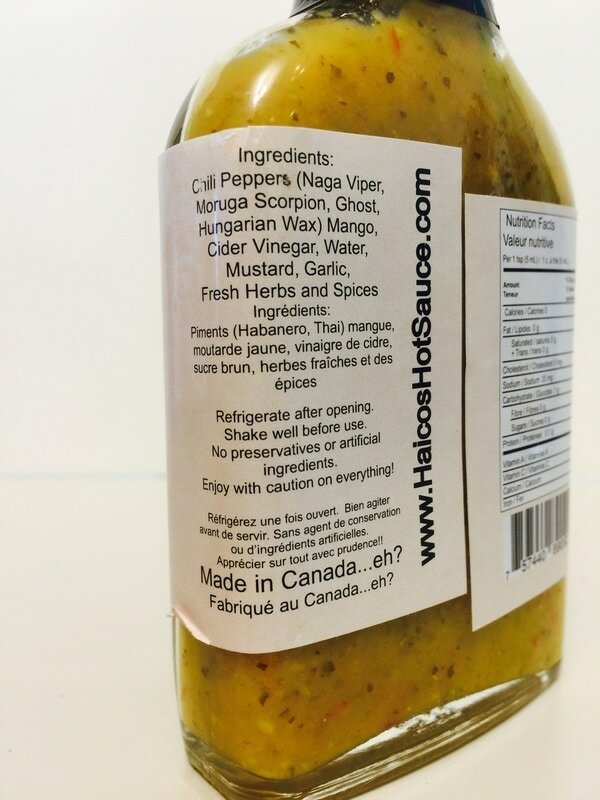 This is a special reserve hot sauce, only available once a year in limited numbers. The fresh flavors of the sweet vidalia and green onion really comes out in this sauce. You will also notice a little sweetness from the Canadian maple syrup with a perfect mixture of fresh herbs and spices. Then you get all the heat and flavor of the hottest peppers in the world, Carolina Reaper, Scorpion peppers, Ghost peppers and Habaneros. The addition of these peppers and the rest of the ingredients, makes a very flavorful super hot sauce. If you think Haico's GARLIC GHOST is hot, just wait, this one has a LOT more heat! This is a limited edition, so if you see it, grab it, because if you are a fan of the super hots, you will love this! This is a great all around sauce, great on eggs, pizza, mixed into your burger, added to your tomato sauces or just pour it on your favorite foods. 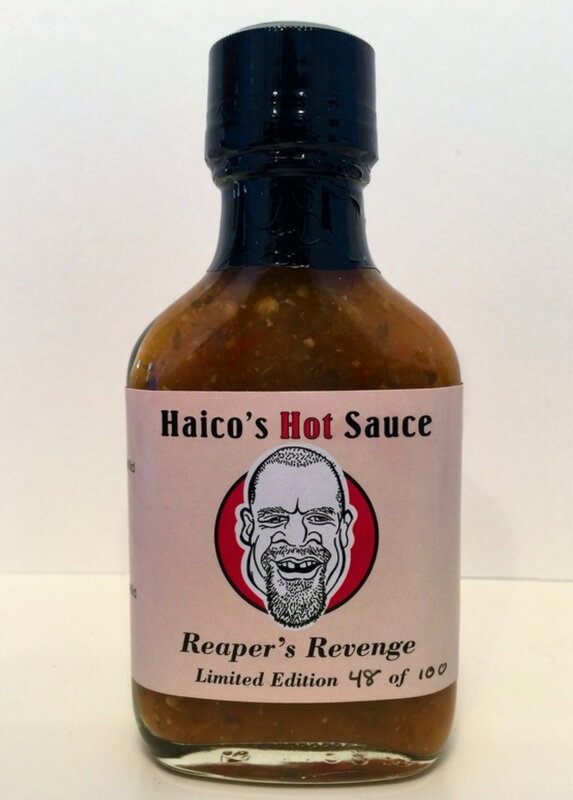 REAPER'S REVENGE from HAICO'S HOT SAUCE.. A limited edition sauce you don't want to miss out on! Just an amazing flavor, and from the first taste, I was hooked! The consistency of this sauce is like a blended salsa with texture and flavor all in one. 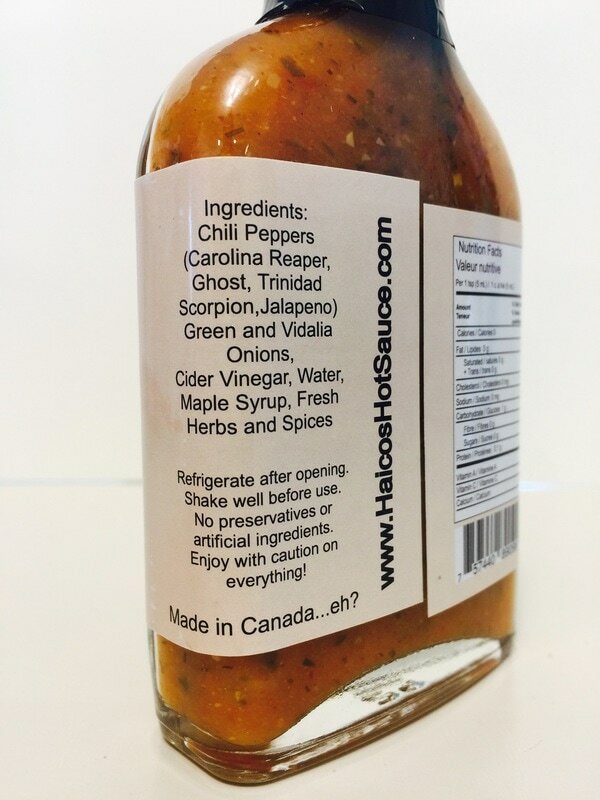 The flavor is fresh and with the reaper, chili, jalapeno, cayenne and habanero peppers mixed together, fantastic! With the addition of vinegar, lemon, maple syrup and fresh herbs and spices, you will definitely want this sauce over and over again. It's a great blend of ingredients to make this hot sauce a favorite. This works great with eggs, fish, burgers, as a sandwich spread or just pour on chips. Get yours before it's gone! 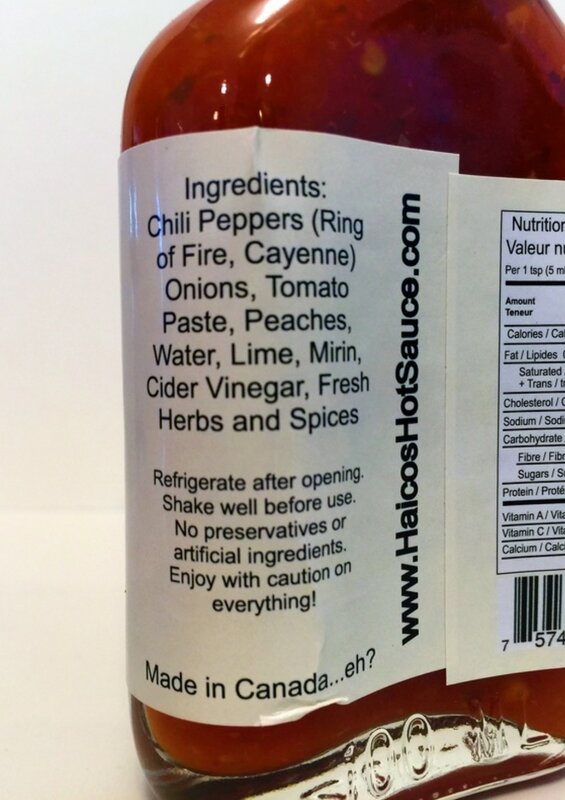 RING OF FIRE from HAICO'S HOT SAUCE.. Once again this sauce has the texture of a fine salsa with flavorful ingredients. With the heat and flavor from the chili, ring of fire and cayenne peppers, the real flavors that brings this sauce to life are the onion, tomato paste and freshness of the peach. You also get a hint of lime and vinegar, and the addition of Mirin (a rice wine), really brings a smoothness to this sauce. What a great tasting sauce! I used this sauce on pork chops and it would pair great with fish, BBQ or any tomato based dish. 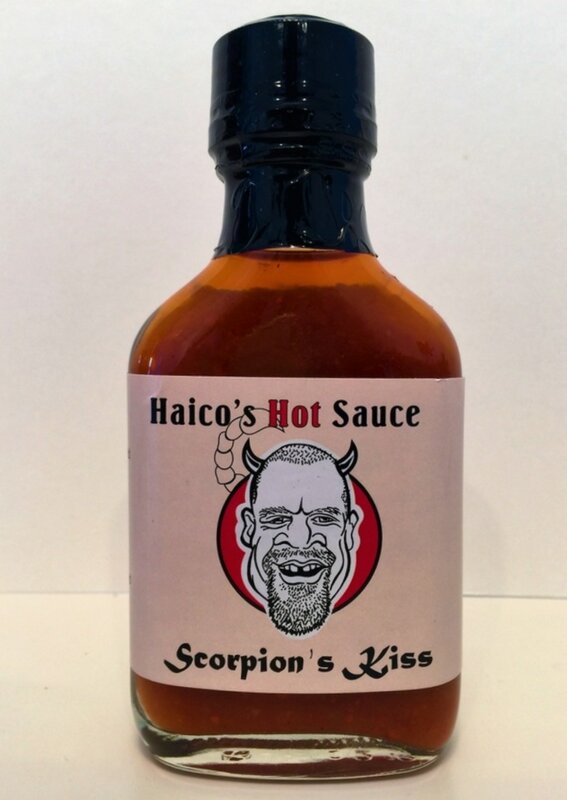 SCORPIN'S KISS from HAICO'S HOT SAUCE.. This is a much finer sauce then the other two but with the same great flavor you would expect from Haico's. The chili, scorpion, ghost and jalapeno peppers bring a great pepper flavor with lots of heat. You can really taste the onions and the sweetness from the maple syrup along with all the other ingredients. The mixture of everything in this sauce will defiantly fire up your taste buds and have you coming back for more. Your morning omelettes will come alive with this as a topping. This makes a great stake sauce or a fantastic hot wing sauce.